Bright mauve (H2) flowers, I–IV; mid-green foliage; spreading habit; height 16–20cm; spread 31–45cm. Heliotrope (H12) flowers, I–IV; dark green foliage with a tinge of bronze hue; vigorous; height 10–15cm; spread 31–45cm. Has a longer flowering period than 'Vivellii' which it resembles. Seedling found at Blairgowrie (Perthshire, Scotland) by Jack Stitt and named after Lady Duncan of Jordanstoun. Heliotrope (H12) flowers, II–III; dark green foliage; similar habit to, but more compact than, 'Loughrigg'; height 10–15cm; spread 26–30cm. Rose-purple flowers, II–III; foliage tiny dark green leaves; very compact habit created by the many short side shoots; height 10–15cm; spread 16–20cm. It has the same habit as 'Sneznik', only even more compact and with a stronger flower colour. The mini-flowers are densely packed. Chance seedling in Brita Johansson's garden: it "came up near to 'Sneznik' 6 or 7 years ago". Arro is the name of one of Mrs Johansson's daughter's ferrets! ® E.2008:06 registered on 12 May 2008 by Brita Johansson, Vargon, Sweden. Deep pink (H8) flowers, I–V; mid-green foliage; height 10–15cm; spread 31–45cm. Seedling; introduced (as E. herbacea) by Jongkindt-Coninck (Dedemsvaart, Netherlands); introduced by 1919. Named from atro- = dark; ruber = red. Heliotrope (H12) flowers, II–IV, very abundant; mid-green foliage; height 10–15cm; spread 31–45cm. Possible seedling; found by J. W. Sparkes (Beechwood Nursery, Beoley, Redditch, Worcestershire, England); introduced by J. W. Sparkes by 1971. Named after the Worcestershire village near Sparkes' nursery. Mauve (H2) darkening to pale purple (H10), II–IV; dull green foliage; height 16–20cm; spread 31–45cm. Attractive flower colour. Replacement name for 'Startler' (introduced by 1955 by Maxwell & Beale) which is an invalid name because another cultivar of Erica had previously carried this same name. [Referred to as 'Startler' in the following, e. g. Catalogue 1955-1956, Maxwell & Beale: 5; F. J. Chapple, The heather garden: 95 (1960; revised edn) __ 119 (1964 edn); J. F. Letts, Hardy heaths & the heather garden: 76 (1966, 2nd edn); D. Small & A. Small, Handy guide to heathers: 66 (1992: 1st edn); __: 106 (2001, 3rd edn)]. Registered on 19 December 2012 by The Heather Society. Pale lavender (H3) flowers, III–IV; mid-green foliage; moderate spreader; height 10–15cm; spread 26–30cm. Shell-pink (H16) flowers darken to lilac-pink (H11), III–IV; mid-green foliage; height 10–15cm; spread 31–45cm. Introduced by 1820; Loudon listed it in 1830. Named after the latin carneus = flesh-coloured. Deep rose-pink flowers, I–III; dark green foliage with a bronze hue; vigorous, open, spreading habit; height 10–15cm; spread 46–60cm. Named after Mrs Catherine Kolster, the finder's wife. Magenta (H14) flowers with crimson (H13) sepals, I–IV; dark bronze-green foliage; broad spreading habit; height 10–15cm; spread 31–45cm. Introduced by H. van Gemeren & S. C. van der Wilt (Boskoop, Netherlands) in 1986. It is perceived as a challenge to 'Myretoun Ruby' which it is! Flowers heliotrope (H12); II-IV; foliage green; habit broad, spreading, compact, to 15cm tall. Chance seedling (parentage not known): found in a plastic propagation tunnel in 2000 by W. Siegers, Soerendonk, Netherlands. A compound name, named after the finder's cousin, Chanel Liplijn, and sister-in-law, Nelly Stevens-Bogers. Registered on 10 June 2002 by W. Siegers. Shell-pink (H16) flowers darkening to heliotrope (H12), III–IV; dark green foliage; moderate spreader; height 10–15cm; spread 46–60cm. Seedling; introduced by Messrs R. V. Roger Ltd (Pickering, Yorkshire, England) by 1982. Named after the wife of J. C. Fletcher, heather foreman at R. V. Rogers Ltd. (Pickering, Yorkshire). Shell-pink (H16) flowers, I–V, in long spikes, profuse; mid-green foliage; vigorous trailing habit; height 10–15cm; spread 31–45cm. Named after a great-grandmother of the Simmersons. Flowers: clear pink (same as ‘Treasure Trove’) with no hint of mauve; III-V; foliage mid-green in Summer; habit bushy, upright; height 20cm; spread 25cm after 3 years (not pruned). Chance seedling (perhaps from ‘Rosalie’) found in 2007 at Forest Edge Nurseries by David Edge. Named “Clear pink flower colour (pink bells)”. ® E.2010:13 registered on 8 December 2010 by David Edge, Woodlands, Wimborne, Dorset. Flowers bright pink; XII-IV; foliage green; habit dwarf with needle-like leaves; height 40-60 cms, spread 40-60 cms. Flowers salmon (H15) without any trace of blue, single, larger than normal; II-IV; foliage dark green; habit broad, erect shrub to 30cm tall, 35cm across after 3 years. Seedling raised and selected by Kurt Kramer in 2010. ® E.2016:01 Registered on 18th February 2016 by Kurt Kramer, Edewecht-Süddorf, Germany. Flowers cerise (H6): II-IV; foliage dark green; habit compact; height 20cm; spread 30cm after 3 years. Seedling raised by Kurt Kramer in 2005. ® E.2010:07 registered on 14 June 2010 by Kurt Kramer, Edewecht, Germany. Pink (H8) flowers darkening to heliotrope (H12), XII–V, abundant; mid-green foliage; height 10–15cm; spread 46–60cm. A good floriferous heather. Seedling; found by David McClintock in his garden at Bracken Hill (Platt, Kent, England) about 1960, and exhibited by him in the late 1960s; rooted and subsequently shown by Jack London (Norfolk) at Royal Horticultural Society shows in 1975 and 1980. Named after David McClintock, President of The Heather Society. Pink (H8) flowers darkening to heliotrope (H12), XII–II; mid-green foliage; vigorous spreading habit; height 10–15cm; spread 31–45cm. Seedling; raised by C. R. Roots (nureryman); on trial at the Royal Horticultural Society's Gardens, Wisley, in February 1966. Named from the flowers and flowering month. Plants of 'December Red' '... may also have been distributed under the names 'Pirbright Rose' and 'Springwood Rose' ... and also under the name Springwood Pink - dark flowered form ...'. Heliotrope (H12) flowers from almost white buds, II–IV; foliage dark green; compact spreading habit; height to 15cm; spread to 60cm. R. S.
Seedling; found by R. S. Young (Spindleberry, Church Road, Mersham, Ashford, Kent, England) during the winter 1992-1993. Named it after his wife. Registered 15 April 1996: R. S. Young, Spmdleberry, Church Road, Mersham, Ashford, Kent TN25 6NS, England. Deep heliotrope (H12) flowers, I–V; dark green foliage; very vigorous trailing habit; height 16–20cm; spread 31–45cm. Probable seedling; found in Norway in 1944; introduced by Lars Odegaarden (Dømmesmoen Gantner, Norway) by 1971. Named after a horticultural school in Norway. Salmon-pink flowers (H15), I–IV; mid-green foliage; compact habit; height 10–15cm; spread 26–30cm. Seedling found by H. A. Verheul (Dwingeloo, Netherlands) and introduced by him in 1998. Pale lilac-pink (H11) flowers, X–III; bright green foliage; spreading habit; height 10–15cm; spread 31–45cm. Seedling; introduced by Sherwood's Nursery (Oregon, USA) by 1968. Name alludes to the flower colour and early-blooming habit. Magenta (H14) flowers with cream sepals, X–IV; dark green foliage; slow growing; height 16–20cm; spread 16–20cm. Has a reputation for being unreliable but still well worth trying. Seedling from Erica carnea 'Praecox Rubra'; raised by J. W. Porter (Dundonald, County Down, Northern Ireland) in 1934; introduced by Maxwell & Beale (Broadstone, Dorset, England) in 1940. Named after raiser's second wife; Mrs Porter was herself a keen heather collector, finding Erica cinerea 'Little Anne', and Calluna vulgaris 'Anne Dobbin'. Light red flowers, II–III; dark green foliage which turns bronze in winter; neat compact habit; height 10–15cm; spread 26–30cm. Seedling raised by D. Lohse (Bullenkuhlen, Schleswig-Holstein, Germany) by 1995. It is one of the earliest red-blossomed cultivars to bloom. Almost white (pale H16) flowers, aging to pink (H8), with pink (H8) sepals, XII–IV; mid-green foliage; trailing habit; height 10–15cm; spread 31–45cm. Seedling, perhaps from "the two Springwoods" (i.e. 'Springwood White' and 'Springwood Pink'); found by J. F. Letts (Foxhollow, Windlesham, Surrey, England) and introduced by him about 1960. Bright lilac-pink (H11) flowers, XI–II; dull green foliage; compact; height 10–15cm; spread 26–30cm. Wild-collected; found in Switzerland by Richard Potter of Backhouse Nurseries; introduced by Backhouse Nurseries (York) Ltd in 1911. Named after the latin for slender. Purple (H10) flowers, I–III; dark green foliage; compact; height 10–15cm; spread 26–30cm. A seedling found in his garden by Fritz Kircher (Hamburg, Germany) in 1987. Registered 1 September 1994: Fritz Kircher, Hamburg, Germany. Lilac-pink (H11) and cerise (H6) flowers, aging to magenta (H14), with cerise (H6) sepals, II–IV; dark bronze-green foliage; neat habit; height 10–15cm; spread 31–45cm. Named after Jack H. Brummage's original nursery. Heliotrope (H12) flowers, I–V; mid-green foliage, sometimes the young shoots hav red tips in spring; compact; height 10–15cm; spread 26–30cm. Seedling; raised by Lieutenent-Colonel J. H. Stitt (Drumcairn, Blairgowrie, Perthshire, Scotland) by 1972; introduced by G. Yates (Tabramhill Gardens, Newstead Abbey Park, Nottinghamshire, England) by 1977, as Erica x darleyensis. Lavender (H3) flowers, III–IV; mid-green foliage; loose straggly habit; height 10–15cm; spread 31–45cm. Named after James Backhouse III (1861-1945), proprietor of Backhouse Nurseries (York) Ltd. (see Occasional papers, National Botanic Gardens, Glasnevin 8: 44-45 (1996)). Lilac-pink flowers (H11) rapidly darkening to pink (H8), II–IV; mid-green foliage, with prolific creamy yellow young shoots in spring and summer; spreading habit; height 10–15cm; spread 46–60cm. Collected near Lake Plansee, Austria, and named in memory of an infant son of a friend of the finder. Registered 19 February 1993: David Small, Creeting St Mary, UK. Magenta flowers, I–III; dark green foliage; neat compact habit; height 10–15cm; spread 31–45cm. A selected seedling from a deliberate cross between 'Myretoun Ruby' and 'Heathwood' made by John Hall and named after his wife, Jean Barbara. it has a deeper colour, larger flowers and blossoms earlier than 'Heathwood'. Pink (H8) flowers darken to heliotrope (H12), XI–IV; dark green foliage; neat and compact habit; height 16–20cm; spread 31–45cm. One of the earliest winter heaths to blosson. Seedling found by Geoff Yates (Tabramhill Gardens, Newstead Abbey Park, Nottinghamshire, England) in 1960s; introduced by Geoff Yates. Named after Mrs Geoffrey Yates. Heliotrope (H12) flowers, I–IV; dark green foliage; vigorous; height 10–15cm; spread 31–45cm. Found in John Kampa's Conifer Nurseries, West End, Woking, Surrey. Named after nursery owner, and son-in-law of Underwood. Lilac-pink (H11) flowers which are white in bud giving a bicoloured effect, I–III; mid-green foliage; strong growing plant; height 10–15cm; spread 31–45cm. A seedling found by D. Cox in 1975 in his own garden at Syston, Leicestershire; introduced by Goscote Nurseries (Crossington, Leicestershire) in 1983. Named after a nursery foreman. Pink (H8) flowers, XII–III; dark green foliage; very compact habit; height 10–15cm; spread 21–25cm. One of a series of clones collected in Switzerland by Richard Potter of James Backhouse Nursery, York. Deep pink flowers, II–IV; dark green foliage; very compact; height 10–15cm; spread 26–30cm. Selected from seedlings of 'Myretoun Ruby' by Kurt Kramer (Edewecht, Germany). Similar to 'Lohses Rubin'. Ideal for patio planting. Calluna vulgaris 'Winter Rubin' is a legitimate replacement name for 'Kramer's Rubin' requested by the introducer. Pale pink (H8) flowers, I–III; dark green foliage; vigorous spreading habit; height 10–15cm; spread 31–45cm. Named after the place in Italy where it was collected by David McClintock. Pink flowers, II–V; mid-green foliage; spreading habit; height 10–15cm; spread 46–60cm. Very similar to Erica carnea 'March Seedling'. Name is an allusion to the flowering time and flower colour. Heliotrope (H12) flowers, XI–IV; mid-green foliage, shoots tipped with salmon and gold particularly in spring; slow growing; height 10–15cm; spread 21–25cm. A sport from 'King George'; found about 1955 by J. W. Sparkes (Beechwood Nursery, Beoley, Redditch, Worcestershire, England); introduced either by J. W. Sparkes or J. F. Letts about 1966. It took 3 years before the sport could be rooted. Named after a granddaughter (daughter of Joan) of J. W. Sparkes. Shell-pink flowers, II–IV; mid-green foliage; compact; height 10–15cm; spread 31–45cm. Magenta (H14) flowers, I–III; dark green foliage; habit very compact; height 10–15cm; spread 26–30cm. Found by M. Lohse (Schleswig-Holstein, Germany) and rated highly in trials at Bad Zwischenahn, Germany. Named after the finder. Rubin = ruby. Bright crimson (H13) flowers, similar to 'Myretoun Ruby' but has a much more compact habit; height 10–15cm; spread 26–30cm. Soft rose flowers deepening to bright carmine, III–IV; mid-green foliage; close compact habit; height 10–15cm; spread 31–45cm. A seedling raised by D. Lohse (Bullenkuhlen, Schleswig–Holstein, Germany) by 1995. Pink (H8) flowers deepening through rose-pink (H7) to heliotrope (H12), I–V; dark green foliage with shades of bronze; vigorous spreading habit; height 10–15cm; spread 46–60cm. Outstanding. 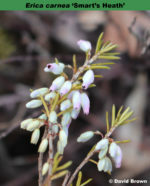 Possible seedling of Erica carnea 'Vivellii'; found by G. Hayes (Grasmere, Cumbria, England), and introduced by Robert Hayes by 1948; available from Maxwell & Beale (Broadstone, Dorset) in 1946. Named after one of the Lake District's fells, between Grasmere and Ambleside. Pale heliotrope (H12) flowers, II–V, abundant; mid-green foliage; height 10–15cm; spread 46–60cm. One of the later winter heaths to blossom. Lilac-pink (H11) flowers, I–III; green foliage in summer turning yellow-bronze in winter; height 10–15cm; spread 31–45cm. A sport from 'Queen Mary'; found by W. D. Frearson (Grange-over-Sands, Cumbria, England); introduced by 1982. Named after the finder's wife, Margerie, and is a typographical error. Pink flowers, II–IV; dark green foliage; open spreading habit; height 10–15cm; spread 31–45cm. A sport, of Dutch origin, from 'Rubinteppich' and named after the finder's son. Pink (H8) flowers, XII–V; grey-green foliage; height 10–15cm; spread 46–60cm. Collected in Switzerland by Richard Potter and introduced by Backhouse Nurseries (York) Ltd. in 1911 (as E. carnea 'Mrs Samuel Doncaster'). Named after Emma Gertrude (nee Barber) (1853-1937), wife of Mr Doncaster, Quaker steel maker and friend of George Backhouse. Although the cultivar name originally was ‘Mrs Samuel Doncaster’, McClintock (1969) recommended using ‘Mrs Sam Doncaster’. This latter spelling is in common use, and is being proposed for conservation under the ICNCP (1995, Art. 14). The proosal was accepted by the ICNCP in November 2003. Flowers purple (H10); II-IV; foliage orange-brown; habit compact; height 20cm; spread 30cm after 3 years. ® E.2010:05 registered on 14 June 2010 by Kurt Kramer, Edewecht, Germany. Purple (H10) flowers, I–IV; dark green foliage; neat, compact, upright habit; height 10–15cm; spread 31–45cm. Selected from seedlings of 'Myretoun Ruby' by Kurt Kramer (Edewecht, Germany): deepest and brightest cultivar of the winter heath. Magenta (H14) flowers with lilac-pink (H11) sepals, II–IV, abundant; dark green foliage with light green shoot-tips in spring; compact; height 10–15cm; spread 31–45cm. Shell-pink (H16) flowers which darken, XII–V, small; dull green foliage; height 10–15cm; spread 26–30cm. Listed by T. & J. Backhouse (York) by 1821. Named from pallidus = pale. Originally published as var. pallida. It is unlikely that Backhouse's original clone is the same as the present one. Profuse pink flowers held well above foliage, in compact spikes; I–III; foliage mid-green; habit compact; height 10–15cm; spread 21–25cm. Sport from 'Cecilia M Beale'. Pink (H8) flowers darkening to deep heliotrope (H12), II–III; fresh-green foliage; open spreading habit; height 10–15cm; spread 46–60cm. Pink (H8) flowers, I–III; mid-green foliage; open, spreading habit; height 16–20cm; spread 31–45cm. Selected from seedlings of 'Myretoun Ruby' crossed with 'Springwood White'; raised by John Hall in 1986 at Windlesham Court Nurseries (Windlesham, Surrey, England); selected by Hall, and introduced after 1991. Name alluding to the flower colour. Lilac pink (H11) flowers (slightly paler at the base); XI–IV; mid-green foliage; height 10–15cm; spread 31–45cm. Wild-collected; found in Switzerland by Richard Potter of Backhouse Nurseries; introduced by Backhouse Nurseries (York) Ltd. in 1911. Shell-pink (H16) flowers getting darker, I–V; mid-green foliage; vigorous spreading habit; height 10–15cm; spread 31–45cm. Seedling; found in a garden in Cornwall, England, variously described as 'at Devoran' or a "Mrs P. H. Davey's at Saffron Meadow on one of the creeks of the Fal River', by Neil Treseder in 1961; introduced by Treseder's Nursery (Truro, Cornwall) in 1966 . Heliotrope (H12) flowers, XII–III; grey-green foliage; height 10–15cm; spread 26–30cm. Named after a town in Surrey where the introducing nursery was situated. Mauve (H2) flowers with heliotrope (H12) tips, I–III; mid-green foliage; vigorous; height 10–15cm; spread 46–60cm. Seedling found at Polden Acres Nursery (Edington, near Bridgwater) about 1980. Magenta (H14) flowers, I–V; dark green foliage; height 10–15cm; spread 31–45cm. Very similar to 'Myretoun Ruby', but blooms earlier in milder districts. Heliotrope (H12) flowers (tips deepest madder brown); XI–V; dark green foliage sometimes tinged brown; vigorous with a semi–prostrate habit; height 10–15cm; spread 31–45cm. Flowers 'rich rose carmine self, tips deepest madder brown'. * Heliotrope (H12; RHS 70B) flowers, Nov-May, with dark green foliage sometimes tinged brown. Vigorous with a semi-prostrate habit. 15cm tall, 40cm spread. Named from praecox = precocious, early (usually referring to flowering time); ruber = red. Shell-pink (H16) flowers, XI–V; mid-green foliage, and the leaves have a distinctive curl; height 10–15cm; spread 31–45cm. Collected in Switzerland by R. Potter and introduced by James Backhouse, York. Named after the eldest son of King George V.
Heliotrope (H12) flowers with pale pink base, burnt sienna tips., Nov-Mar, with dark green foliage. 20cm tall, 40cm spread.Heliotrope (H12) flowers, XI–III; dark green foliage; height 16–20cm; spread 31–45cm. Collected in Switzerland by R. Potter and introduced by James Backhouse, York. Named in honour of the consort of King George V.
Lilac-pink (H11) flowers shading to shell-pink (H16) at the base, XI–V; mid-green foliage; height 10–15cm; spread 26–30cm. Collected in Switzerland by R. Potter and introduced by James Backhouse, York. Named in honour of a grand-daughter of Queen Victoria. Pink (H8) flowers darkening to mauve (H2), with shell-pink (H16) sepals, XII–V, very floriferous; mid-green foliage; height 10–15cm; spread 31–45cm. Seedling, perhaps a cross between Erica carnea 'King George' and Erica carnea 'Springwood Pink'; introduced by 1971. Named after a well known horticulturist Randle Blain Cooke (1881–1973). Deep pink (H8) flowers darkening to heliotrope (H12), II–III, in long spikes; mid-green foliage; vigorous trailing habit; height 10–15cm; spread 46–60cm. Seedling; found by J. Anderson in Broadhurst Nursery (Grampound, near Truro, Cornwall, England) in 1974; introduced by Felsberg Nurseries (Liskeard, Cornwall). Flowers ruby; foliage dark green with bronze tips; habit open.Faster growing than 'Nathalie'. A seedling found on his nursery by John Proudfoot,Almondell Nursery, Methven, Perthshire, in 1990. Heliotrope flowers, XII–II; dark green foliage; vigorous, trailing habit; height 10–15cm; spread 31–45cm. Darker than 'December Red'. Of Dutch origin; named after the raiser's son. White flowers with a slight violet blush, II–IV; light green foliage; open spreading habit; height 10–15cm; spread 31–45cm. Found by S. Ketelaar in a private garden in Holland in 1985. Named in September 1993 and introduced by G. van Hoef (Barneveld, Netherlands). Bright pink flowers, I–IV; bronze-green foliage; low upright flowering stems making it suitable for growing in pots; height 10–15cm; spread 31–45cm. Highly recommended. Selected from seedlings of 'Myretoun Ruby' by Kurt Kramer (Edewecht, Germany) in 1981; introduced by Kramer in 1990. Clone ERI 4; submitted for plant breeders' rights in Germany by Kramer; rights granted in Germany on 18 December 1991. Very attractive rose pink (H7) flowers with little hint of blue, III–IV; mid-green foliage; height 10–15cm; spread 31–45cm. Selected from seedlings of 'Myretoun Ruby' by Kurt Kramer (Edewecht, Germany); raised by Kurt Kramer (Edewecht-Süddorf, Germany) in 1981; introduced in 1992. Clone ERI 8; submitted for plant breeders' rights in Germany on 23 March 1992; rights granted on 27 October 1993. Clear pink (H8) flowers, I–III, sparse; dark green foliage; height to 20cm; spread to 40cm. Not a good plant: shy flowering and poor growth. Heliotrope (H12) flowers, I–V; dark green foliage; height 16–20cm; spread 31–45cm. Available from Maxwell & Beale (Broadstone, Dorset, England) in 1946; that nursery may have introduced this cultivar. Named after an allusion to the flower colour. Lilac-pink (H11) flowers, XI–IV, abundant; mid-green foliage; spreading habit; height 10–15cm; spread 26–30cm. Beetroot (H9) flowers, XI–IV; dark green foliage turning reddish in winter; slow growing; height 10–15cm; spread 26–30cm. The flowers are redder than all other cultivars of winter heath. Selected from seedlings of 'Myretoun Ruby' by Kurt Kramer (Edewecht, Germany). Magenta (H14) flowers, larger than normal, I–IV; dark green foliage deepening to bronze-green in winter; compact, broad spreading habit; height 10–15cm; spread 26–30cm. Of Dutch origin found by Albert Bosch about 1985 at nursery. Registered on 29 October 2006 by Albert Bosch, Westerlee, Netherlands. Heliotrope–magenta (H12/H14) flowers, I–IV; mid-green foliage; vigorous; height 10–15cm; spread 31–45cm. Seedling from 'Springwood White' x 'Vivellii'; raised in 1964 and introduced in 1967 by H. Hachmann (Barmstedt, Schleswig-Holstein, Germany). The name means literally ruby carpet. Deep lilac-pink flowers; I-III; foliage dark green; height 15cm; spread 40cm. This name was in use as early as 1838. Maxwell & Beale (Broadstone, Dorset, England) used the name in the 1920s for a 'very dark early' cultivar. 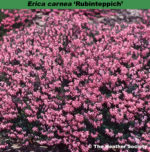 'Rubra' may be synonymous with Erica carnea 'Praecox Rubra' pre-1911; and also with Erica carnea 'Vivellii' (1906-1911). Named after ruber = red. Magenta (H14) flowers, I–V; mid-green foliage; spreading habit; height 10–15cm; spread 31–45cm. Probably from Jongkindt Conuicks (Dedemsvaart, Netherlands); introduced by Conuicks in 1921. Name alludes to the colour of the flowers. Tiny pink flowers, II–IV; tiny mid-green leaves; height 10–15cm; spread 21–25cm. An unusual plant best suited for tubs and sink-gardens; a very small cultivar, a sport from 'Winter Beauty'. Found by H. Kruse. nurseryman of Bad Zwischenahn by 1991. Mauve (H2) flowers, I–III; dark green foliage; compact; height 16–20cm; spread 31–45cm. Seedling; found at Schatzalp Alpine Garden (Guggenbacht, near Davos, Switzerland) by 1987; introduced by H. Frei Nursery (Wildensburg, Zurich, Switzerland) by 1987. Named after the Alpine garden founded 1968 in Guggenbacht, near Davos, Switzerland. Lavender (H3) flowers, I–IV; mid-green foliage; slow growing; height 10–15cm; spread 21–25cm. Possible seedling; raised and introduced by Sherwood Nursery (Portland, Oregon, USA) in 1963. Named after the nursery, and its habit. Corolla and calyx heliotrope (H12); III-IV; foliage dark green; young shoots silvery white in spring and summer, turning pink in winter when temperature drops. Sport on 'Praecox Rubra'; found in 1992 by G. K. Langenberg on his former nursery at Boskoop.Registered on 24 June 2003 by J. D. van der Lip. Lilac-pink (H11) flowers, I–III; mid-green foliage that turns bronze in winter; height 10–15cm; spread 31–45cm. Probable seedling; found on his nursery at Smart's Heath Lane, Woking, Surrey, England, by Mr Lane; introduced by John F. Letts (Foxhollow, Windlesham, Surrey) by 1966. Originally distributed as Erica carnea 'Springwood Pink: dark form'. Named after Smarts (no apostrophe) Heath Lane, Woking, Surrey, where John Letts obtained stock from a local nursery. The name when first published was spelled with an apostrophe. Small rose-purple flowers, II–III; tiny dark green leaves; unusual compact habit created by the many short side shoots; height 10–15cm; spread 16–20cm. Named after a mountain in Slovenia where it was found. Flowers heliotrope (H12) darkening to pale crimson (H13), I–III; mid-green foliage; spreading habit; height 10–15cm; spread 31–45cm. Seedling; found at Spring Cottage (Usk, Monmouthshire, Wales), about 1965; introduced by Otters' Court Heathers (West Camel, Somerset, England) by 1981. Named after Mrs Parris's house. Heliotrope (H12) flowers, I–V; mid-green foliage; height 10–15cm; spread 31–45cm. 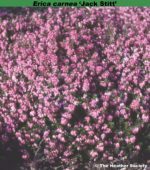 A sport from 'Springwood Pink'; introduced by 1986 from Ridgway Heather Nursery, or Springfield Nurseries by 1987. Pink (H16) flowers becoming darker, XII–V; mid-green foliage, the new shoots bronze; vigorous, trailing habit; height 10–15cm; spread 31–45cm. Seedling, perhaps from Erica carnea 'Springwood White'; found by Mrs Ralph Walker (Springwood, Stirling, Scotland) before 1930. Named after Mrs Walker's house, and the flower colour. Dark pink (H5) flowers, II–IV; dark foliage. Heliotrope (H12) flowers, III–IV; grey-green foliage; height 10–15cm; spread 21–25cm. Salmon (H15) flowers, II–IV; mid-green foliage; compact twiggy habit, slow growing; height 10–15cm; spread 31–45cm. Recommended. Distinctive colour break amongst winter heaths. Lilac-pink (H11) flowers deepening to magenta (H14), with lilac-pink sepals, III–IV; dark green foliage; spreading habit; height 10–15cm; spread 31–45cm. Found among rooted cuttings from Scandinavia by P. Bakhuyzen (Boskoop, Netherlands). Heliotrope (H12) flowers that darken to magenta (H14), I–V; dark green foliage with distinct bronze tinge; height 10–15cm; spread 31–45cm. Although still popular, 'Adrienne Duncan' is more reliable. Collected in the Engadive Alps, Switzerland, by Paul Theoholdt in 1906; introduced by Theoboldt (Aulendorf, Wurttemberg, Germany) in 1909.
named after the head of Theoboldt's former firm, Adolf Vivell (1878--1959), a landscape architect of Olten, Solothurn, Switzerland. Magenta (H14) flowers, II–IV, abundant; mid-green foliage; neat but vigorous spreading habit; height 10–15cm; spread 31–45cm. Seedling; found at Nagel Nursery (Bretten, Germany) in 1982. Magenta (H14) flowers, I–III; dark green foliage, young shoots tinged pink in spring; neat habit; height 10–15cm; spread 31–45cm. Seedling; introduced by Pennyacre Nurseries (Springfield, Fife, Scotland) by 1976. White flowers becoming suffused with pale pink, II–III; mid-green foliage; open spreading habit; height 10–15cm; spread 46–60cm. A sport from 'March Seedling' found by R. Bratfisch in Germany before 1986. Plants traded under the name Erica carnea "Margaret Benson" may be indistinguishable from this cultivar. Pink (H8) darkening to magenta (H14), I–III; dark green foliage; compact; height 10–15cm; spread 31–45cm. A seedling found by Anne Parris at her home in Usk, Gwent, Wales, and named after a nearby wood. Pink (H8) flowers, the bud the colour of gunmetal; flowers Pale Italian pink, suffused in a most delicate grey, pink at base, burnt sienna tips. , XI–IV; dark green foliage; rather loose open habit; height 10–15cm; spread 31–45cm. Shell-pink (H16) flowers, II–IV; mid-green foliage; vigorous spreading habit; height 10–15cm; spread 46–60cm. Seedling; found by W. R. A. Parsons (Wood Close, Woolhampton, Berkshire, England); introduced by W. R. A. Parsons. Name alludes to the flowering time. Flowers deep clear pink: II-IV: foliage dark green: height 10-15cm: spread 26-30cm. Compact plant similar to Erica carnea 'Lohse's Rubin' but has less blue in flower colour. Selected from seedlings of 'Myretoun Ruby' by Kurt Kramer (Edewecht, Germany). This is a legitimate replacement name for 'Kramer's Rubin' requested by the introducer. Pale shell-pink flowers turning dark purple, I–III; mid-green foliage; good, spreading habit; height 10–15cm; spread 26–30cm. Found and propagated by David Wilson(Chilliwack, British Columbia, Canada). Lilac-pink (H11) flowers darkening to magenta (H14), II–V; red-brown foliage; height 10–15cm; spread 31–45cm. Selected from seedlings of 'Myretoun Ruby' by Kurt Kramer (Edewecht, Germany), this one has an unusual and new foliage colour. The name refers to the attractive display of the buds against a winter sun.